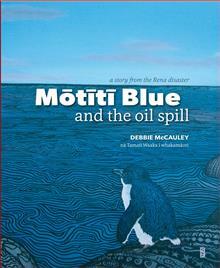 Tells the story of a little blue penguin who was covered in oil as a result of the oil spill from the Rena shipwreck. Describes his rescue, the treatment he had at the Te Maunga Oiled Wildlife Response Unit and his release back into the wild. Sidebars provide more information abo... read full description below. Bilingual text in Te Reo Maori. On 5 October 2011 a large container ship grounded on a reef off the coast of the Bay of Plenty, spilling an estimated 350 tonnes of heavy fuel oil into the ocean. The impact was devastating, not only for the people of the area, but for the many thousands of birds and sea creatures who were covered in the toxic oil. One of these oiled birds, a little blue penguin we've named Motiti Blue, was rescued and treated at the Te Maunga Oiled Wildlife Response Centre. This is the story of his recovery and release.